Have you tried the Windows 7 Performance Edition(PE)?Windows 7 PE is not actually released by Microsoft it’s only a tweaked version of Windows 7 operating system customized by hackers to run faster even on slow PC’s(XP has a PE version too). Note: I won’t be promoting piracy here or talk about morality concerns I will only share what I have experienced with Win 7 PE.lol. Here’s what I find out, it requires a valid product key for activation so, if you have a valid keys try to enter it or otherwise turn off the OS update to avoid Microsoft block your PC. Install it with your own risk. My installation was successfully however not as fast as the original one and I really hate the background colors in the installation wizard, it’s too light and irritating to stare. Maybe the hacker should change it to a very simple one or revert it to the original interface. Compared to the original one, the Win 7 PE works faster in terms of file handling because of its slim interface and less visual effects. I think my PC gain almost 25% optimize speed in moving files around without using a third party software. If you love XP the way it works so simple then, Win7 PE could be your option. 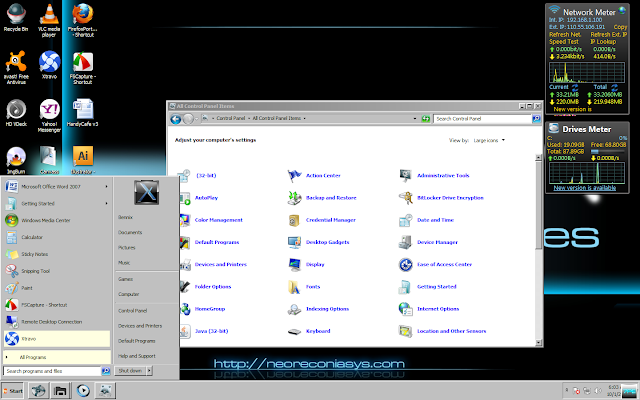 It has same interface with original Win 7 however, the Aero glassy looks was removed and the icons was looking techie. When you right click in the desktop you can access directly the Add /Remove Program, Control Panel, Power Options, Show/Hide Hidden Files, Run, and Task manager menu .In terms of loading I am satisfied with its speed, its less freezing when opening more windows at the same time and no auto-expand effects when a window touch the screen edge. I just want to remind you again that try it with your own risk. Thanks for reading.Please leave a comment if you have some suggestions or concerns. Merry Christmas to all!! !